Cruise trips from the United States to Cuba could experience a significant increase when Carnival Cruise Line, biggest branch of the American company Carnival Corporation, begins its operations towards the Caribbean island next June. That entity announced that departures from the port of Tampa Bay to Cuba will be carried out onboard of the Carnival Paradise, with 2 052 passengers, making it the ship with the largest capacity in history to sail from the United States to Havana. It was known that Carnival Corporation was granted permission to expand trips to Cuba, where it undertook tours on May 2016 under its Fathom line, being the first of that nation in more than 40 years to arrive at Cuban coasts. Pearl Mist, belonging to Pearl Seas line, second American company that connects the two shores, has also reached this destination since last January. 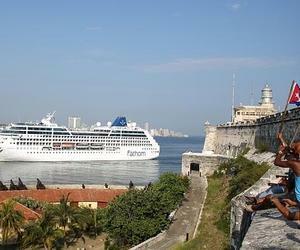 Studies indicate that the Caribbean has established itself as the main cruise market in the world with a participation quota of 40 percent of the total sector, and more than half of the reception of the vacationers is concentrated in the northern part of the region, in which Cuba also occupies a privileged site. However, Cuba has been excluded from these routes due to the restrictions of the blockade, a reality that begins to acquire other nuances from the granting of exceptional permits by the US Treasury Department. Former President Barack Obama authorized 12 general categories, including the possibility of Americans to individually visit Cuba within the category of "educational trips for people-to-people exchange." In 2016, 614 433 Americans visited Cuba, representing a 34 percent increase in comparison to the previous year, although they still cannot do tourism in the Caribbean island, because of the validity of the blockade. The rise of that statistic in 2016, when the Cuban nation received 4 million international visitors, is mainly due to the reestablishment of direct regular flights between Cuba and the United States, which had been suspended for more than 50 years.